This last year, I have become the Johnny Appleseed of elderberry plants. Although, I plant the elderberry plants and not the seeds. I have been making Elderberry jelly and tincture for my family for almost twenty years. We gathered them in Cambria just as we did blackberries. 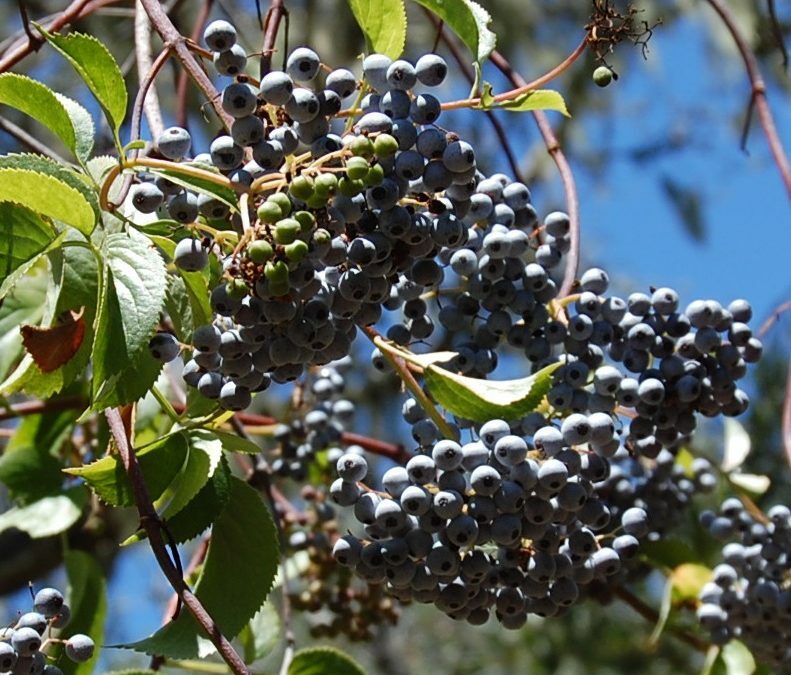 Then when I started landscaping seriously about two years ago to help out my mom, I realized that maybe I would not have to drive for miles to gather berries if I just planted the bushes in our yard and in the gardens to which I have access. Last year, I planted several at work, and several on my mom’s property. This year I planted three at my house, and two in my friends’ yards. However, I might have to wait a few years to see the fruits of my labors. 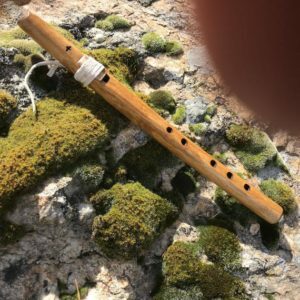 Native Californians also used the hollow branches to make flutes and clapper sticks. They used caution and respect and were aware that there are toxic compounds in the stems and leaves (such as hydrocyanic acid and sambucine.) These are also in the berries, but less so, and dissipate when cooked or dried. 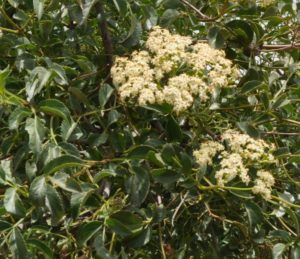 Research has found compounds in Sambucus that are anti-viral. They are also high in vitamin C. I’m sure that hundreds of years ago, when Europeans ate the jelly, and drank the wine all winter it helped them to fend off colds. When making jam or wine, the seeds should be strained out. The flowers are also considered medicinal. 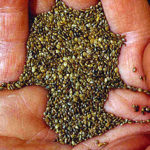 They are picked when flowering then dried for tea that is used to break dry fevers and stimulate perspiration. The USDA Plant Database says that “The flowers contain flavonoids and rutin, which are known to improve immune function, particularly in combination with vitamin C. The flowers also contain tannins, which account for its traditional use to reduce bleeding, diarrhea, and congestion.” They can also be prepared as a delicious cordial. Ethnobotanist Michael Moore writes that “ The flowers and dried berries are useful as a diuretic and have been used for centuries as an aid to rheumatism and arthritis. The red elderberries are toxic and should not be used. 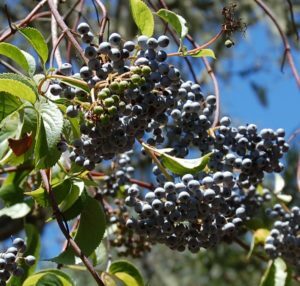 The elderberry grows throughout California and can be drought tolerant but will thrive better and grow much faster with some watering. It tolerates clay soils and seasonal flooding, but it also grows in sandy soil in my yard. It can grow to 10 feet tall. It has green foliage which is deciduous and has cream colored flower clusters. It is a great plant to bring birds into your garden. It also attracts hummingbirds and butterflies.